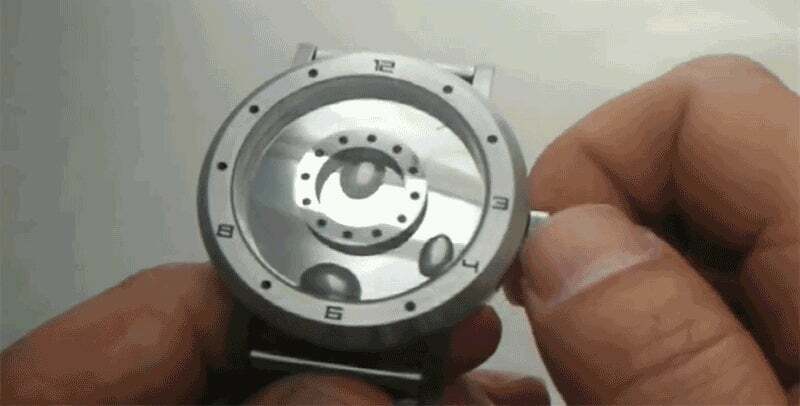 There are a lot of good reasons to believe this watch that uses flowing liquid mercury to show the time is fake. A low-quality video, a questionable website, and product shots that look like photocopies of photocopies. But that doesn’t stop us from wanting a watch that looks like the T-1000 strapped to your wrist. Seahope’s Liquid Metal Watch, designed by Y. Kimura, uses three blobs of mercury that continuously orbit the watch’s face to indicate the current hour, minutes, and seconds. Its website doesn’t go into details about how exactly the company’s creation works—presumably there’s a trio of moving magnets beneath its face—but it will happily let you pre-order one ahead of a July 14 release. Available in various colors and metal finishes, the watch’s will set you back just shy of $200, if you’re brave enough to entrust your credit card details to a sketchy-looking online store. We’d maybe suggest waiting until July 14 comes and goes to see if this thing actually ships, and then maybe hunting one down from a more reputed online shop.